August is not the best time to take a vacation in Texas. However, since we were attending the Teague-Miller Family Reunion in Shallowater, we decided to take our 5th wheel and make a vacation out of it anyhow. The weather was unseansonably cool for about the first week, but started to heat up for the last week and a half, but was still much less humid than home. 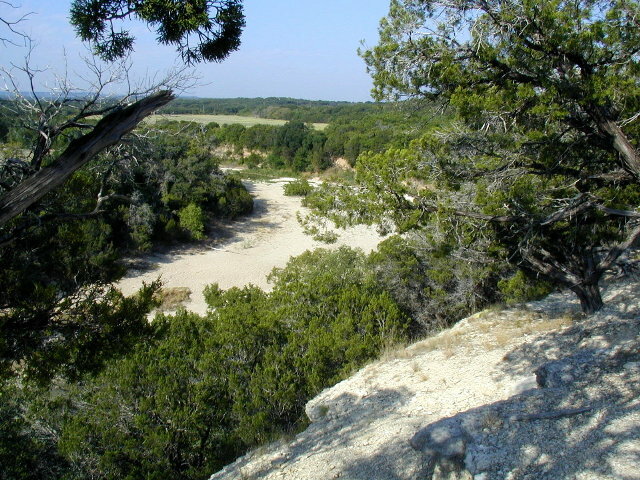 Most of the time we camped in Texas State Parks - six on this trip. 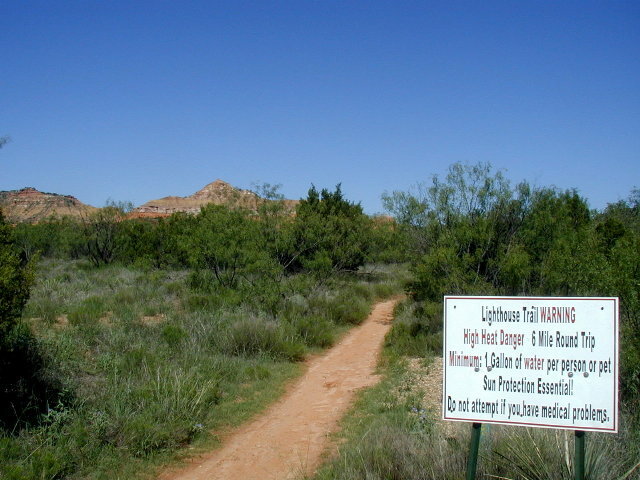 Only one (Palo Duro) had we camped in previously. We really enjoy the Texas State Parks because at night you can hear the soothing sounds of nature, instead of being sardine packed side-by-side next to some freeway with 18-wheelers that you can hear all night. We drove a total of 1,765 miles and used 170 gallons of gasoline, averaging 10.4 miles-per-gallon over the entire trip. [Wednesday] We got away from the house about 9:45AM, August 13th. After a quick stop at Comfy Home to make sure that Kay's mother was still OK, we traveled to Glen Rose via TX-99, IH-10, TX-359, TX-6 and TX-174. We stopped south of Waco at Regan to eat lunch. It was hot all day and was 100 F when we got to Dinosaur Valley State Park. We parked in site #36 and waited for the AC to cool us down. We saw lots of Cardinals outside the trailer windows so I put out some birdseed. We attracted a variety of birds. After supper we walked to Track Sites #2 and #3, then back. We saw lots of Dinosaur tracks in the Paluxy River. The water was low so they were easy to see. We weren't sure they were real to begin, but the park ranger assured us that they were not fakes. 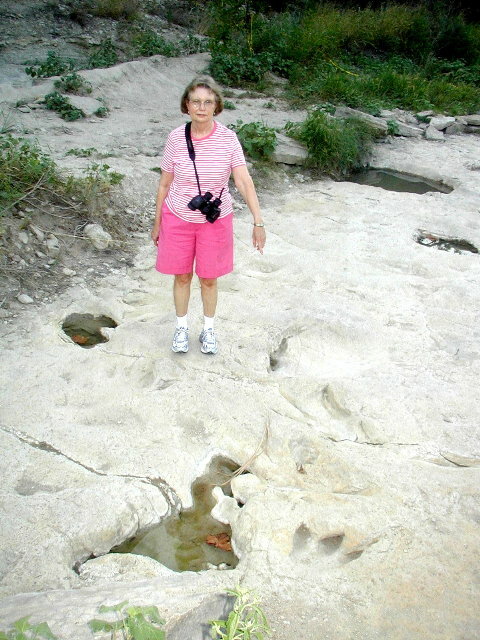 < Kay points out Dinosaur tracks. 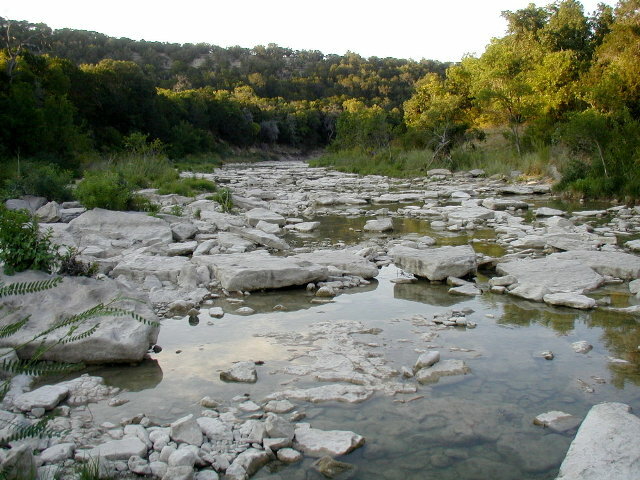 < The Paluxy River in Dinosaur Valley S.P. [Thursday] After breakfast we hiked the White and Blue trails for the approximate 2-mile loop. The trail climbs the ridge that runs along the north bank of the Paluxy River. 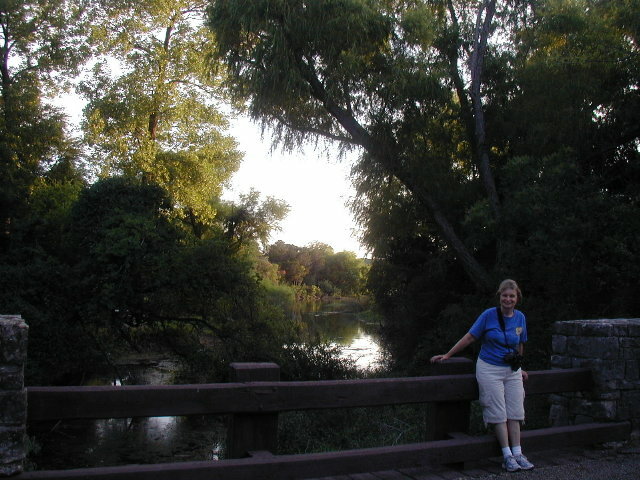 At 7AM the temperature was 69 F so the walk was nice and we were in the shade of the trees most of the way. There was some rocky and steep parts but the trail was good. After lunch it was about 95 F so not good for hiking. We drove a few miles out of the park and visited the Creation Evidence Museum that is nearby. Afterwards we drove around Glen Rose and looked at the historic Somervell County Courthouse. We returned to the State Park and toured the park's museum at the entrance to the park. It has a good exhibit of dinosaur tracks. About 5PM it rained and cooled the temperature down into the 70's. After supper it was very nice and we walked around the campground loop. There were a few campers, but not nearly full. 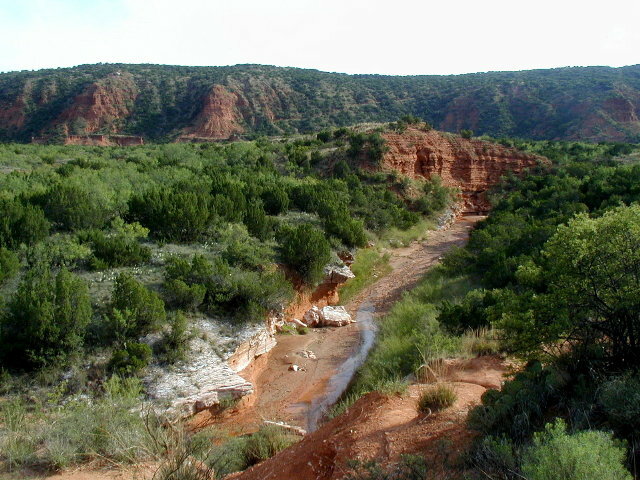 < The Paluxy River as viewed from along the Blue Trail. [Friday] We were awakened at 4AM with a thunderstorm outside. You really hear every raindrop when you live in a plastic house. After breakfast we left Dinosaur Valley S.P. via TX-56, TX-4, IH-20 and TX-84 to Shallowater, which is just northwest of Lubbock. It drizzled rained for the first 50 miles, but the temperature was real nice - 65 to 70 F. We arrived in Shallowater about 6PM. The temperature was still nice - mid 80's and cloudy. We settled into Richard's RV Park. [Saturday] We were awakened again at 3:30AM to the sound of nature's fireworks outside. The intensity of the thunder in the Texas Panhandle seemed much greater than in Houston. It sounded like someone was shooting off canons outside our trailer. Then the blowing rain sounded like we were sending the trailer through a carwash. The rain stopped about 8:30AM. It was nice and cool (low 60's) outside. Today was the first day of the Teague-Miller Family Reunion. Kay baked a blueberry cobbler for the reunion. < The Teague-Miller Family Reunion. [Sunday] It is still cool and rainy but no storms. This morning at the reunion, we were blessed by Mollie's Bible Study and Dalton's Sermon. After another great reunion lunch, we left Shallowater and hightailed it to Palo Duro Canyon State Park via TX-1294, IH-27 and TX-207. 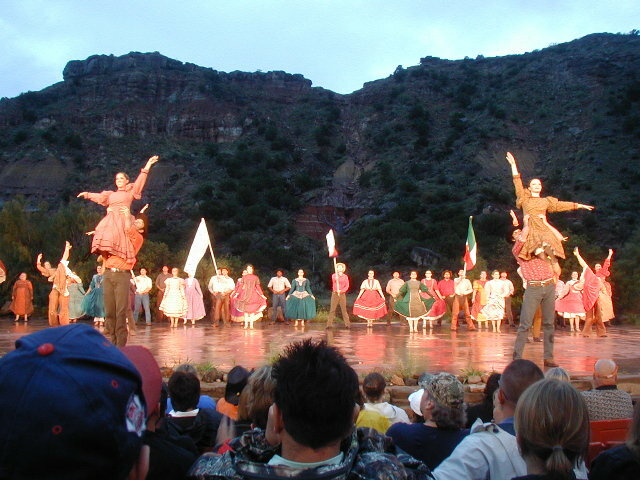 After getting settled into site #131 of the Sagebrush Camping Area, we attended the final showing of the season of the spectacular outdoor musical drama, TEXAS. We also enjoyed the Big Texan Steak and Chicken Dinner prior to the show. Even the drizzly overcast weather could not stop this epic production. A few hours after the show ended and we were back in the trailer, a rainstorm came through again. 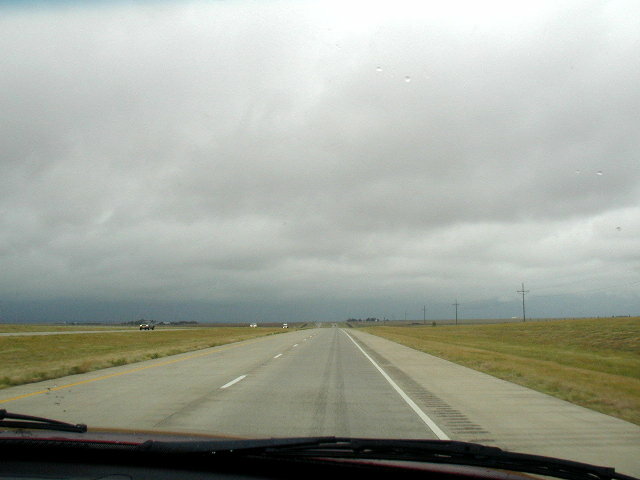 < The weather on the way to Palo Duro Canyon S.P. 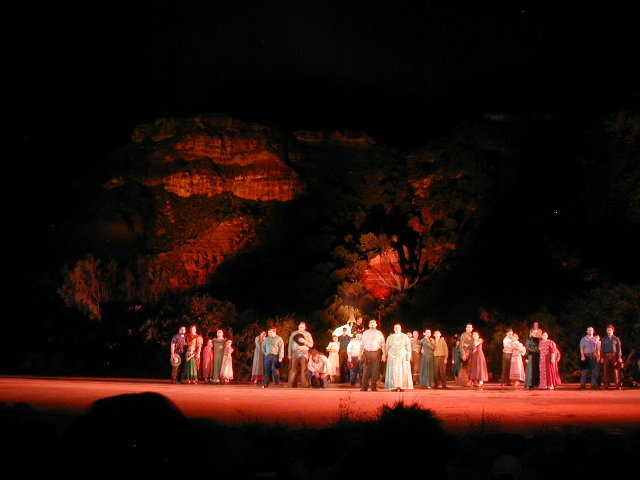 < The spectacular outdoor musical drama, TEXAS! < TEXAS! < Site #131. [Monday] It is still nice and cool this morning, but about half the park is closed because the water crossings are filled with mud starting with #1. Most of the trails are inaccessible and they are wet and muddy anyhow. We decided to temporarily end our park visit after today and go up to Amarillo for a few days to let the park recover from all the rain. Then we plan to come back on the weekend when the rain is supposed to be gone and the crossings and trails opened again. After breakfast we rode up to the rim and made some cell phone calls - there is no service in the canyon. Before lunch we walked down the road toward Hackberry Camp Area but decided to turn around before we got there because we weren't sure how much further we had to go. After lunch we rode back down through the Hackberry Camp Area, then back up on the rim to the Visitor Center. There is a nice museum and gift shop in the Visitor Center and a great view of the canyon. After we returned to the trailer, it rained some more. After supper we walked the Pioneer Nature Trail which was mainly dry. 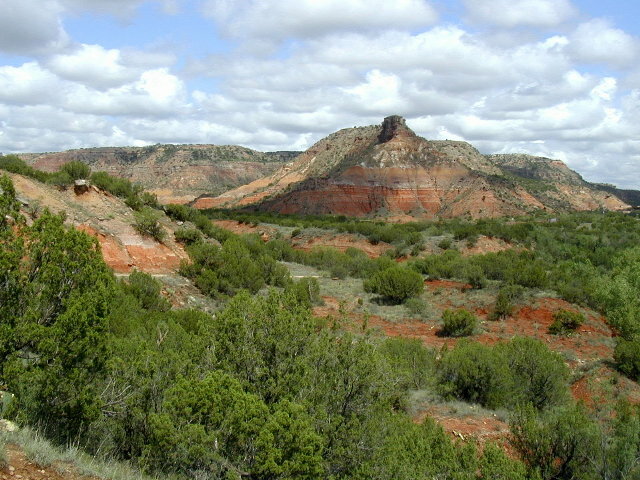 < View of the canyon from the road to the rim. 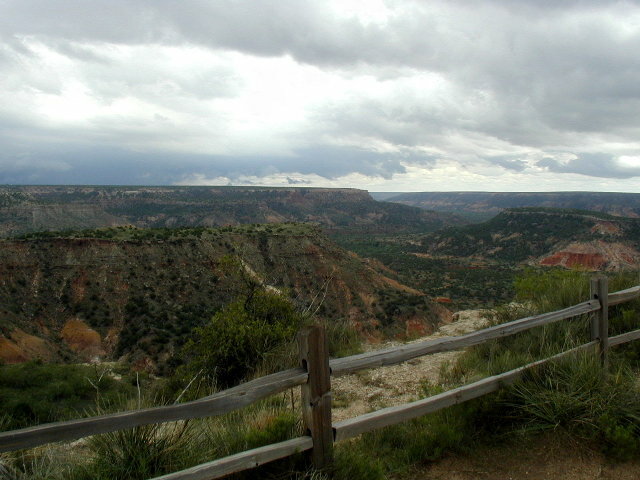 < View of the canyon from the Visitor Center. [Tuesday] After breakfast we left the park and drove to Canyon, TX and met up with Kay's cousin Norma Jean and husband Wilford. He gave us a good spot to park the trailer with hookups in a trailer park he owned. 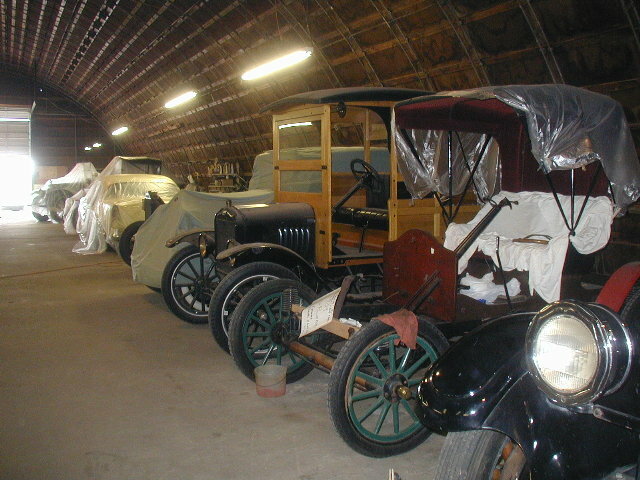 He then gave us a tour at his extensive collection of antique automobiles. Afterwards they treated us to nice lunch at and old store that was converted into a 50's and 60's themed cafe - I think it was called Rock N Roll Soda Shop. In the afternoon we went to the Panhandle-Plains Historical Museum (PPHM). 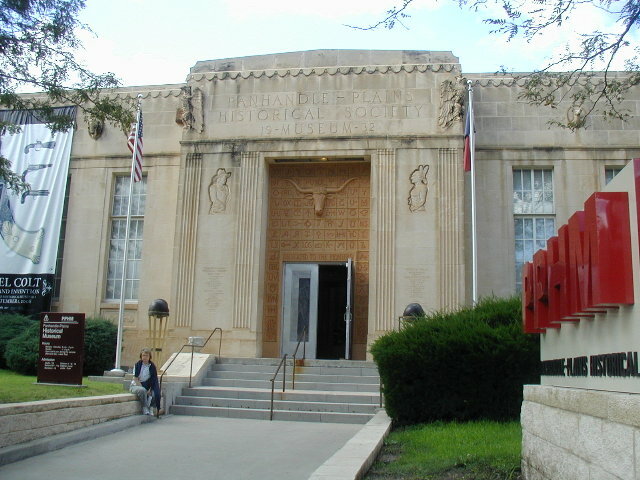 On the campus of West Texas A&M Univ., it honors pioneers of Texas' colorful past and is the largest history museum in the state. After a delicious supper at Norma Jean & Wilford's home, we retired to our trailer. < Just a few of Wilford's toys. < PPHM. [Wednesday] We left Canyon for Amarillo via IH-27. Before we left Canyon, we noticed one of the trailer tires was low, so we stopped at a service station to air it up good. After getting to Amarillo, we decided to locate a Discount Tire store and get it checked out. Turns out we had a nail in the sidewall, so it couldn't be patched. We put the spare tire on until we got back home and used the slow-leaker as a spare. We decided to stay at Amarillo West RV Park. It's a good park for a short stay. That afternoon we drove to downtown Amarillo to the Visitor Center. Then we drove down a portion of the Historic Route 66 that runs through town. We then toured Amarillo Botanical Gardens. It features indoor and outdoor exhibits. The newest is the Mary Bivins Tropical Conservatory, a glass pyramid with more than 6,000 sq. ft. of tropical flora and fauna. We drove by Cadillac Ranch (which turned out to be about 1/2 mile from our RV park) but decided to come back later when it was cooler. After supper we drove back and looked at all the old Cadillacs. They are basically held together by all the spray paint that tourist coat them with every day. We saw markings from Europe and Australia, among the graffiti. 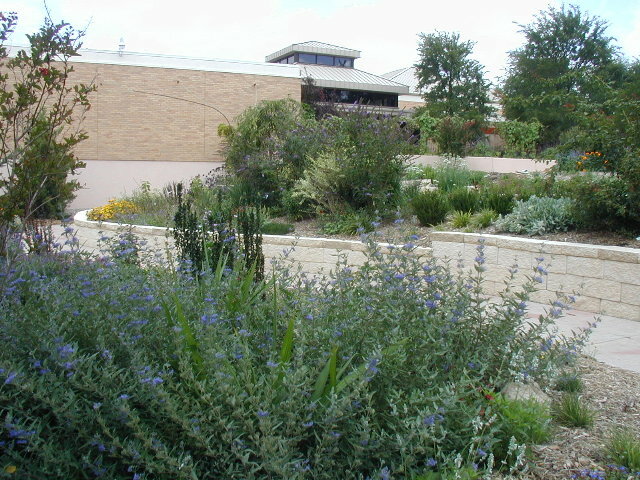 < Amarillo Botanical Gardens. 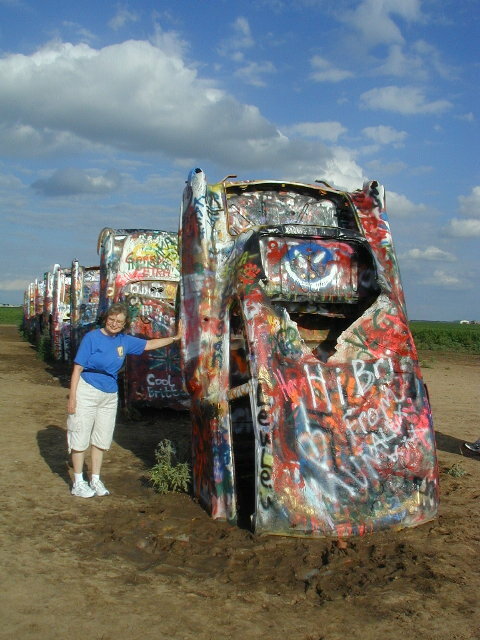 < Cadillac Ranch. [Thursday] Early in the morning after breakfast we drove to Wildcat Bluff Nature Area. It contains more than 600 acres of rolling grassland and nature trails, as well as a small wildlife museum. 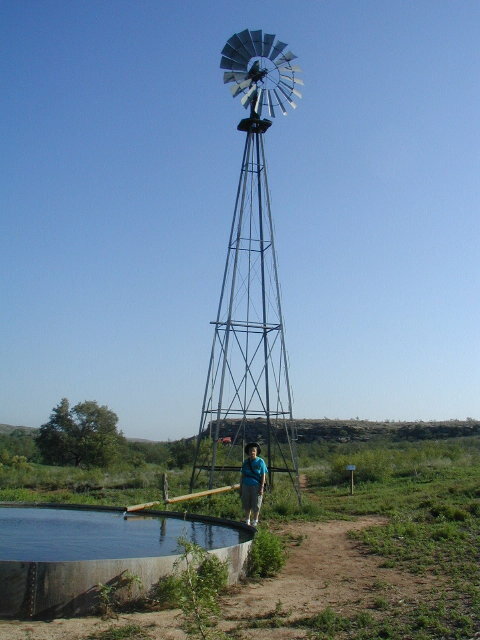 We walked the outer loop trail past a working windmill, then up to the top of the ridge and back down past the Prairie Dog town and back to the Nature Center. It was windy and cool that morning, so a nice walk. We drove to the Central Library to check our email and met with Lawson's cousin Roger and wife Jan. We enjoyed lunch with them at an old downtown store that had been converted to a restaurant. Afterwards we went to the Amarillo Zoo and then the American Quarter Horse Hall of Fame & Museum. We joined Roger & Jan for supper at their home, then they followed us out to see our trailer and have desert. 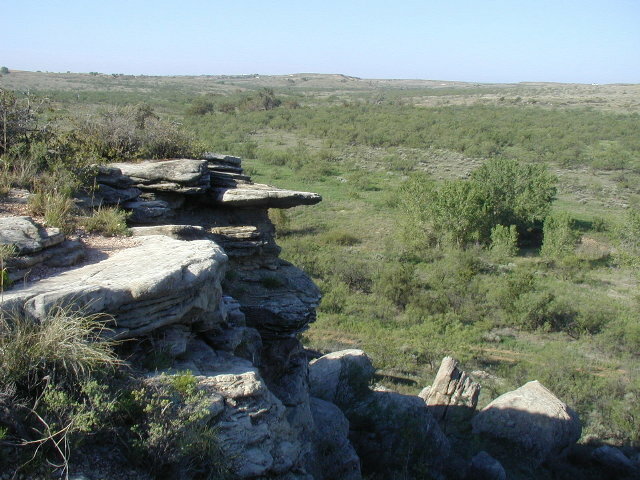 < Wildcat Bluff Nature Area. < Windmill Trail. 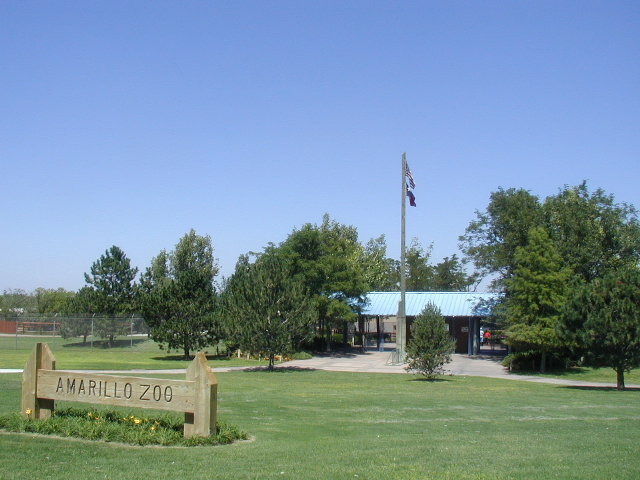 < Amarillo Zoo. 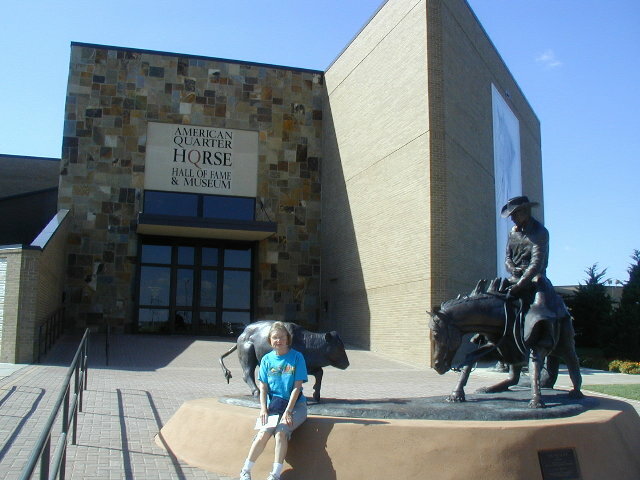 < American Quarter Horse Hall of Fame & Museum. 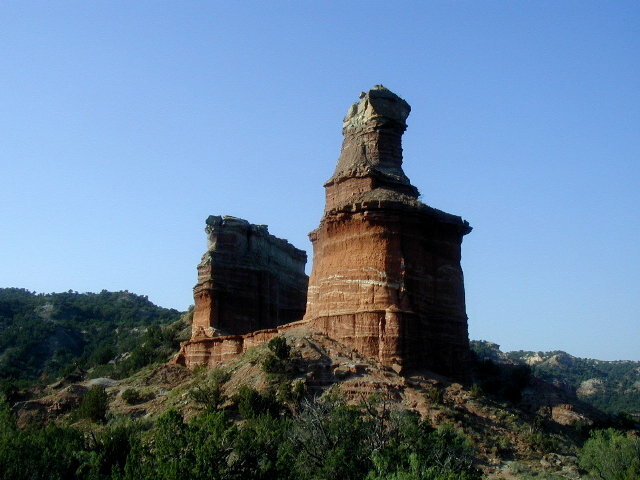 [Friday] We left Amarillo for Palo Duro Canyon S.P. again, but stopped to get a leaking propane gas line fixed. On the way into the park we saw a group of modern day cowboys on horses driving cows toward a windmill, not too different than in the early days. We arrived at the park about 10AM and settled into #130 in the Sagebrush Camp Area. Before lunch, we drove to the end of the park road. All the water crossings had been cleared except for #6. All the trails were now accessible. It was too hot during the afternoon so we stayed in the trailer under the AC. It was very windy and about 95 F.
< Cowboys do their work on the high plains. [Saturday] We set the alarm for 6AM and ate a quick breakfast and drove the short distance to the Lighthouse Hiking Trail. We started the 6 mile round trip at 7:15. The walk was nice and cool most of the way due to our early start. The trail is good but lots of uphill. The last 1/4 mile to get to the top of the Lighthouse ledge was almost straight up. Erosion of the support for the "steps" of landscape timbers made them difficult and tricky to maneuver. We made it to the top and rested for 30 minutes, ate apples and peanut butter crackers and drank some of our water. We were the only people on the trail as we were going up, but we met many more as we started down. We stopped at the Trading Post on the way back and ate lunch. 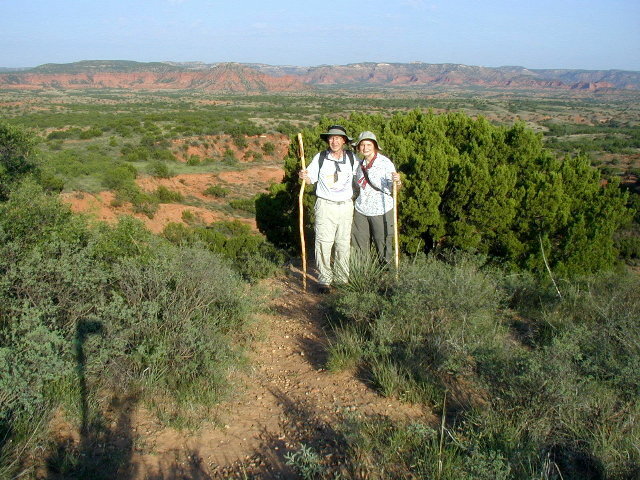 After supper that night, we hiked the CCC Trail overlooking the TEXAS stage a short distance then returned. < Lighthouse Trail. < Capital Peak on the Lighthouse Trail. < The Lighthouse. < Lawson & Kay on top. < One of countless good views on the trail. [Sunday] We attended Church services at 9AM that are held in the canyon during the summer months at the Old West Stables. It is an outdoor church within the walls of the canyon and with the blue sky as a ceiling. It was an inspiring service, with hymns and Bible study that is conducted as a mission from a Canyon church. There were about 30 folks there, but we supposed that Kay & I were probably the only campers present. At this time of the year the park was almost empty of campers - school starts next week. After Church, we left the park and went to Canyon to wash clothes and get groceries. 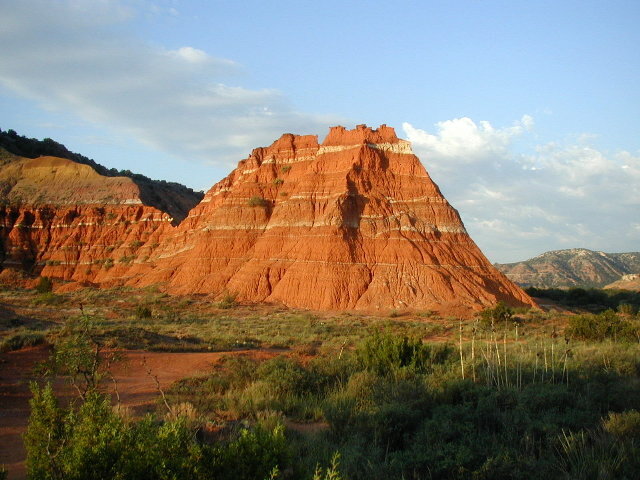 Then we drove TX-1541, TX-1151, TX-1258 and TX-207, a scenic drive across Palo Duro Canyon a few miles down from the park. 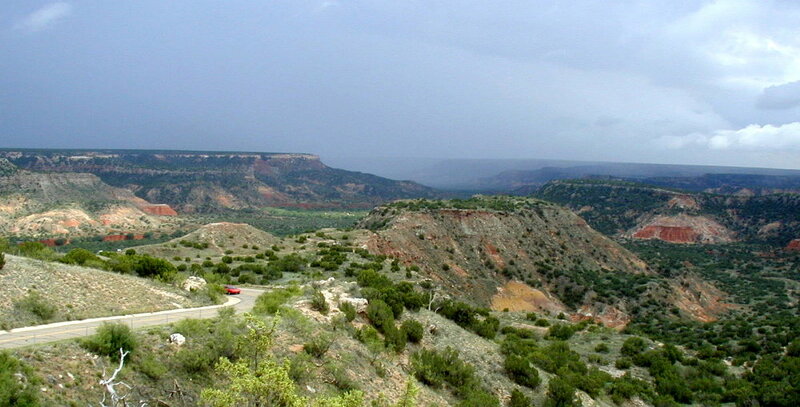 We stopped at a highway park on the south rim to get a good final view of Palo Duro Canyon. 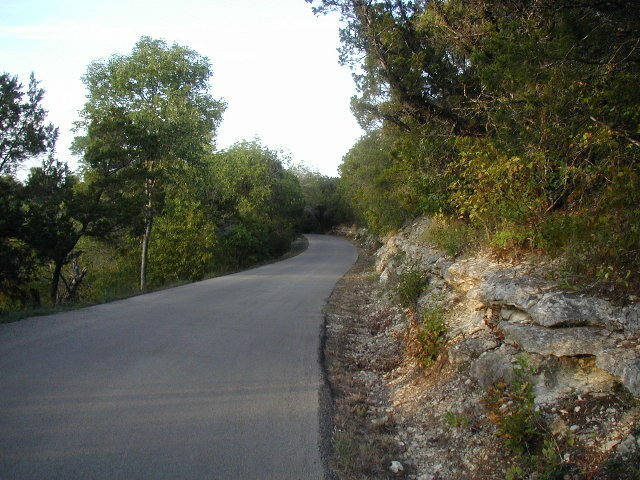 The TX-207 drive is said to be one of the most scenic in the state. We stopped in Silverton and saw the Old Jail Museum next to the Courthouse. The old gentleman looking after it was interesting. 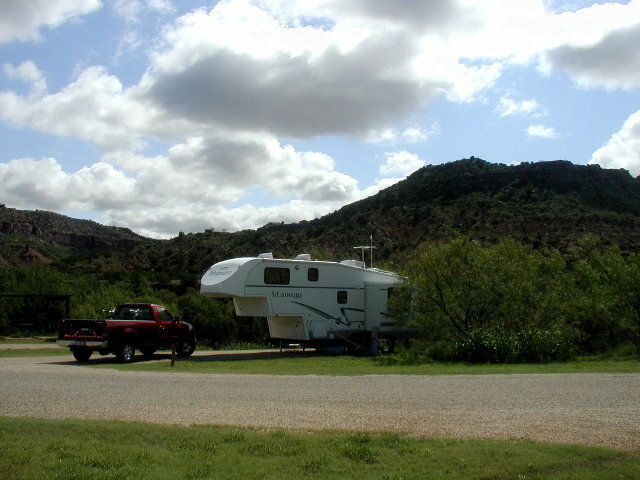 We arrived at Caprock Canyons State Park and set up in site #8 in the Honea Flat Camping Area. We then drove around the park to locate all the trails. 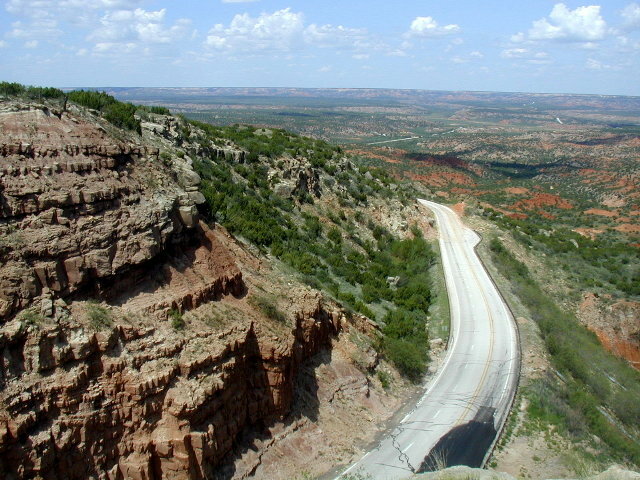 < Scenic TX-207 crossing Palo Duro Canyon. 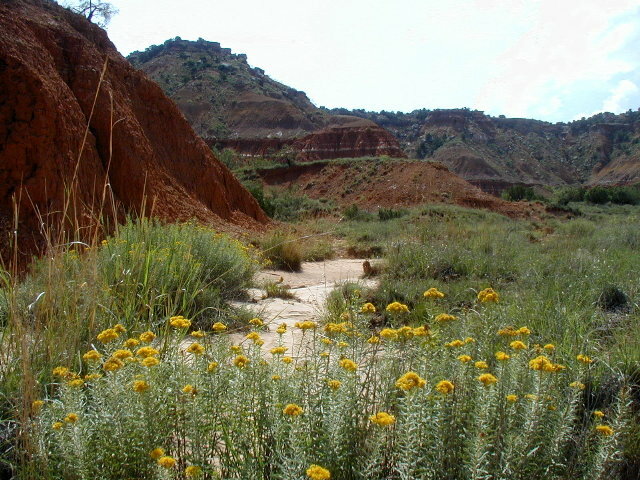 < A nice view in Caprock Canyons S.P. 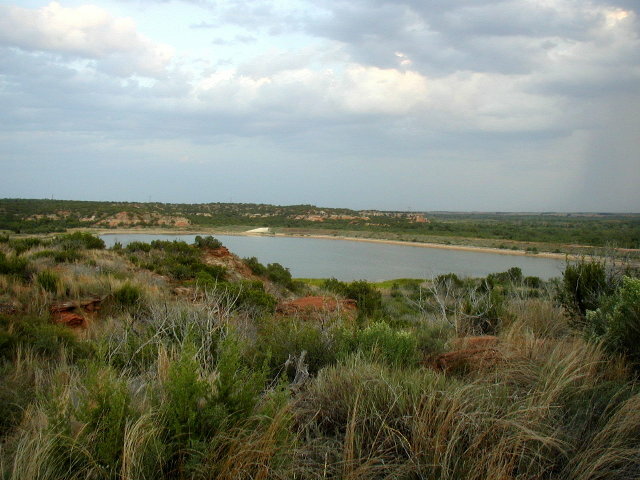 < Lake Theo in Caprock Canyons. [Monday] After breakfast we drove to the Eagle Point Trail and walked about 1 1/2 miles up the trail, then turned around and came back. 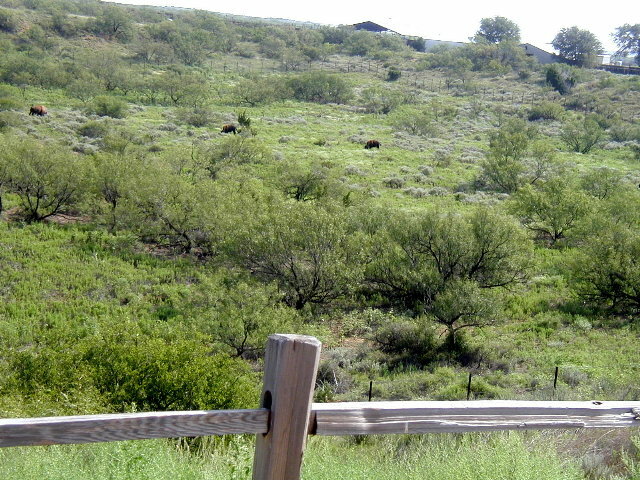 We then drove to the park headquarters and looked at the bison heard that were in the pasture behind the headquarters. We saw the five bulls that were there. About 60 of the cows were pastured outside of the park. I had a Ham Radio schedule with Bob, Bill & Roy back in Houston at 2PM on 40 meters. Afterwards a rain cloud came close and cooled it down so at about 4PM we went to the other end of the Eagle Point Trail and walked to the natural bridge formation and back. After supper we hiked 1 mile down the Upper Canyon Trail and back. < Lawson & Kay on Eagle Point Trail. < Bison grazing in the park. < View on the Upper Canyon Trail. < Kay on the Upper Canyon Trail. 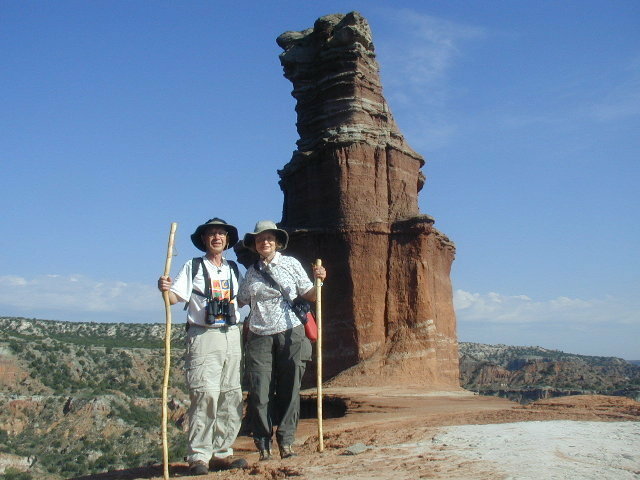 [Tuesday] In the morning after a quick breakfast, we hiked 1 1/2 miles along the Canyon Rim Trail and back. 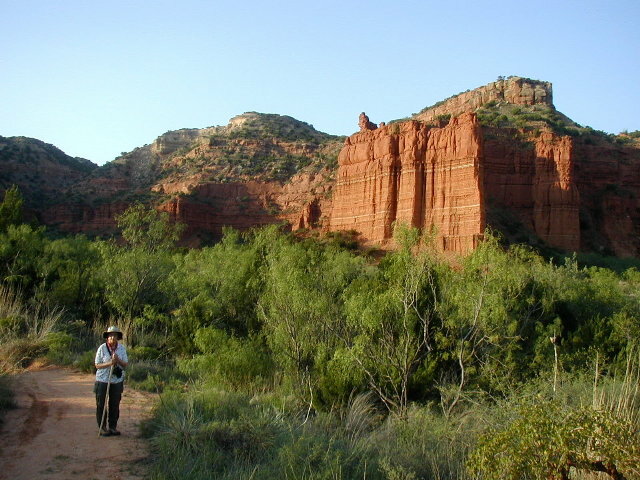 Then we left Caprock Canyons State Park, headed for Copper Breaks State Park south of Quanah. We stopped and ate lunch in Turkey, TX. This interesting Phillips 66 service station in Turkey was in mint condition. We stopped in Childress and photographed and old steam engine that was on display. Then we looked up Kay's great-grandfather and great-grandmother's graves in Childress Cemetery. Then on to Quanah where we stopped at the Courthouse and the Quanah, Acme and Pacific Railroad Depot that is now a museum. When we arrived at Copper Breaks State Park, it was really hot. After setting up in site #11 of the Comanche Camping Area, we sat under the air conditioner until after supper. We then drove around the park. We may be the only campers in the park. It cooled down after a rainstorm got close to the east and we walked down behind our camp to the canyon rim. Then we sat outside under our shelter until dark. 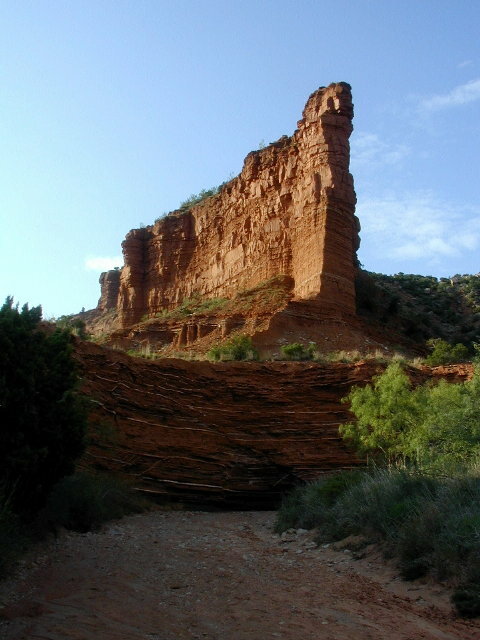 < Our camp site at Caprock Canyons S.P. 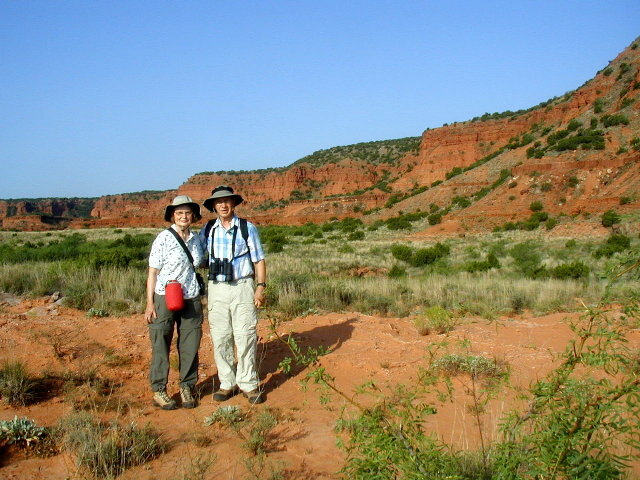 < Lawson & Kay on the Canyon Rim Trail. 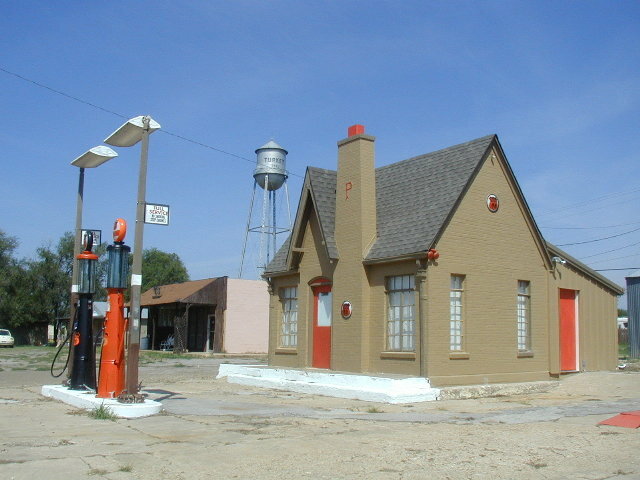 < Old Phillips 66 Service Station in Turkey. 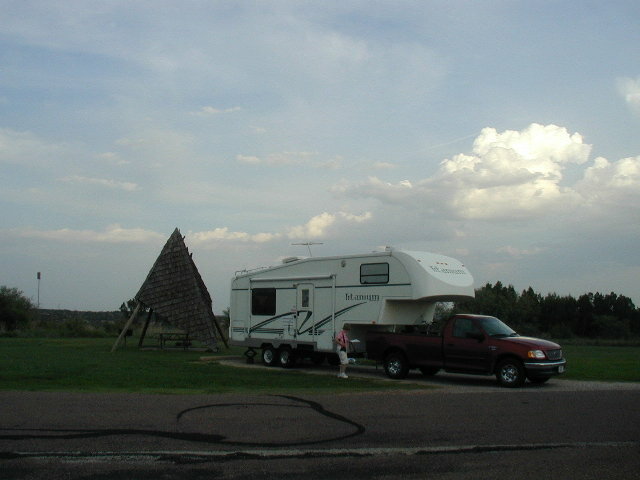 < Our camp site at Copper Breaks S.P. 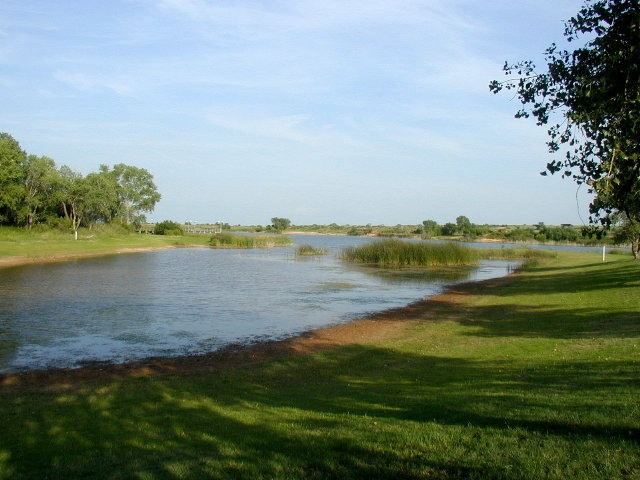 < A view of Lake Copper Breaks. [Wednesday] After breakfast we hiked the short Bull Canyon Trail loop which was mainly through the Mesquite trees - a flat good trail - with lookouts over the little canyon. We went to the Visitor Center and looked at the museum there. It was very good. We left Copper Breaks S.P. after eating lunch and drove through Graham and met Bettye, Kay's cousin, for a short visit on our way to Possum Kingdom State Park southeast of Graham. We setup camp in site #46 of the Shady Grove Camping Area. We had a slight mishap with a park cedar tree. Fortunately no real damage was done but we got a good scare. We drove around the park after setting up the trailer. 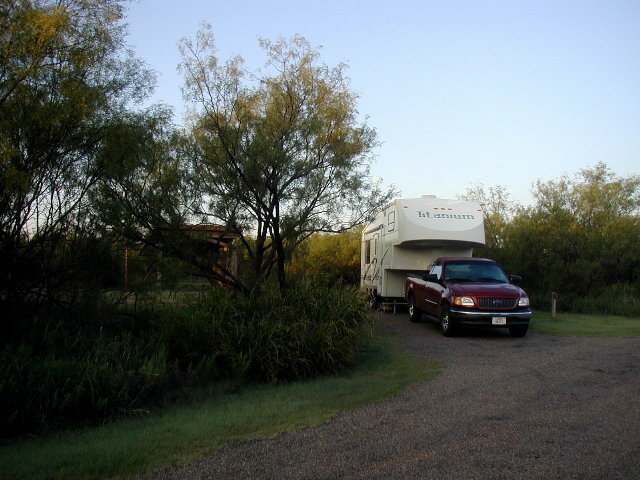 This is an old CCC park and the only RV friendly camping area is the Spanish Oaks Camping Area. When we arrived the park office was closed but we saw a sign posted on all the campsites that said the water should not be drunk. Not good! We had enough water to make it until the next day. 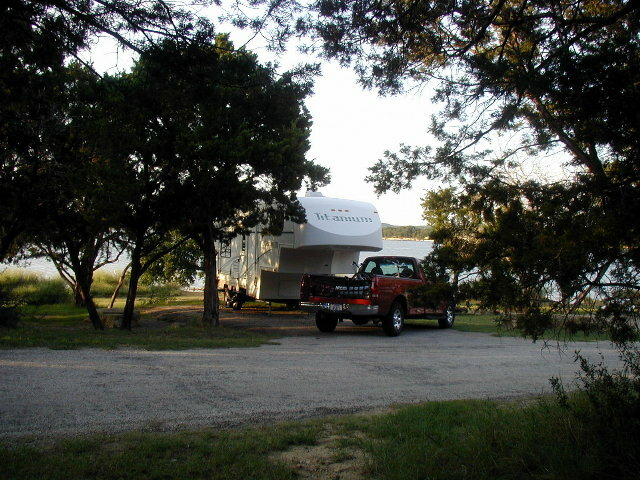 < Our campsite at Possum Kingdom S.P. [Thursday] After breakfast we packed up and left Possum Kingdom. As we stopped at the office, they said that the problem with the water was because it tasted salty, so it was really not unsafe to drink. We drove south on P-33, TX-717, TX-571 and TX-6 to Meridian State Park. On the way we stopped in Ranger to photograph an old train depot. This is a very interesting old town that in it's boom time had about 20,000 people but now only about 2,000. We stopped in Gorman to photograph another old train depot and eat lunch. 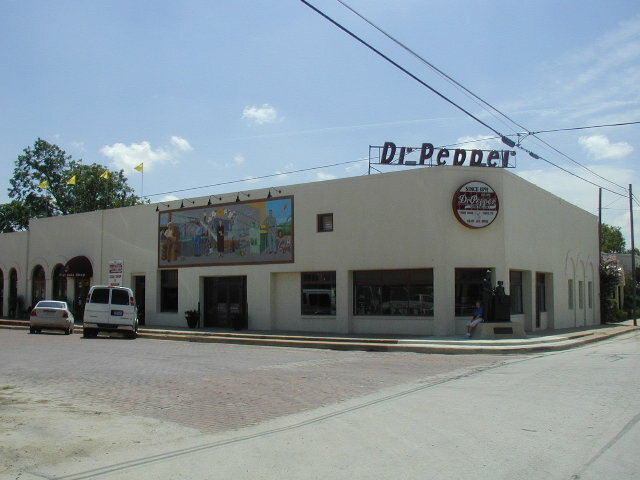 At Dublin we stopped to photograph an old train depot and see the old Dr. Pepper Bottling museum and soda shop. We took a very interesting tour of the old bottling line that still fills the old bottles once a month for collectors that send them their old bottles to refill. 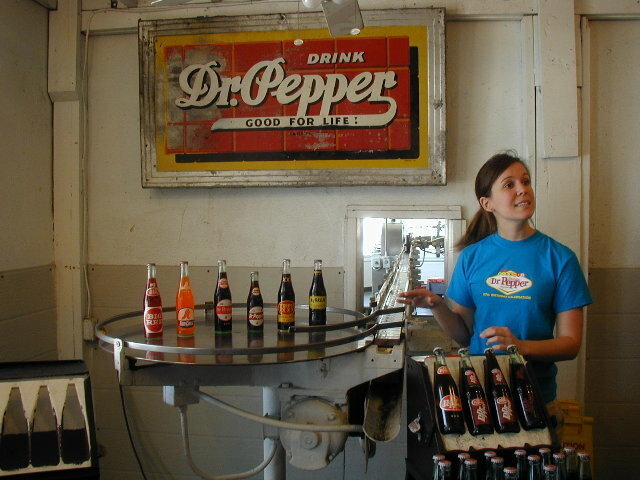 They are the only bottler that still uses Imperial Pure Cane Sugar to sweeten their soft drinks instead of corn syrup. Now all their commercial bottling is done in nearby Temple. Of course we enjoyed fountain drinks in the soda shop. When we arrived at Meridian State Park, the temperature was 100 F. We waited until after supper, then walked some around the lake for about 1/2 mile. < Dr. Pepper in Dublin. < The old bottling line. 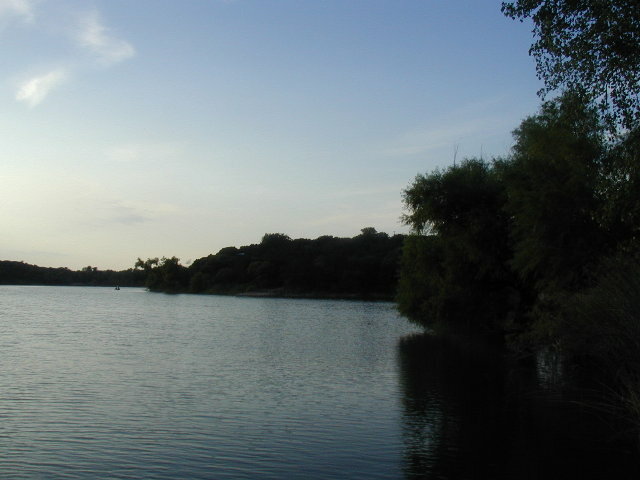 < Lake Meridian at Meridian S.P. < Road through the park. < Kay on the bridge overlooking the lake. [Friday] This morning we started back home to Richmond via TX-6, TX-317 and TX-36. We stopped in Temple and met Kay's cousin James and wife Willa Dean for lunch at Chili’s. After a nice visit we had an uneventful trip back to Richmond. We arrived at home in the mid-afternoon. This draws to a close our visit to the Texas Panhandle. We hope you enjoyed the photos and brief descriptions of our activities. God willing, join us again soon for another RV adventure. Give thanks to the LORD, proclaim His greatness; tell the nations what He has done. Sing praise to the LORD; tell the wonderful things He has done. Be glad that we belong to Him; let all who worship Him rejoice! Go to the LORD for help, and worship Him continually.